A University College London team analysed the genome, and the results were used for a facial reconstruction. No prehistoric Briton of this age had previously had their genome analysed. As such, the analysis provides valuable new insights into the first people to resettle Britain after the last Ice Age. The analysis of Cheddar Man's genome - the "blueprint" for a human, contained in the nuclei of our cells - will be published in a journal, and will also feature in the upcoming Channel 4 documentary The First Brit, Secrets Of The 10,000-year-old Man. Cheddar Man's remains had been unearthed 115 years ago in Gough's Cave, located in Somerset's Cheddar Gorge. Subsequent examination has shown that the man was short by today's standards - about 5ft 5in - and probably died in his early 20s. "So to come face-to-face with what this guy could have looked like - and that striking combination of the hair, the face, the eye colour and that dark skin: something a few years ago we couldn't have imagined and yet that's what the scientific data show." Fractures on the surface of the skull suggest he may even have met his demise in a violent manner. It's not known how he came to lie in the cave, but it's possible he was placed there by others in his tribe. The Natural History Museum researchers extracted the DNA from part of the skull near the ear known as the petrous. At first, project scientists Prof Ian Barnes and Dr Selina Brace weren't sure if they'd get any DNA at all from the remains. But they were in luck: not only was DNA preserved, but Cheddar Man has since yielded the highest coverage (a measure of the sequencing accuracy) for a genome from this period of European prehistory - known as the Mesolithic, or Middle Stone Age. They teamed up with researchers at University College London (UCL) to analyse the results, including gene variants associated with hair, eye and skin colour. They found the Stone Age Briton had dark hair - with a small probability that it was curlier than average - blue eyes and skin that was probably dark brown or black in tone. This combination might appear striking to us today, but it was a common appearance in western Europe during this period. Steven Clarke, director of the Channel Four documentary, said: "I think we all know we live in times where we are unusually preoccupied with skin pigmentation." Prof Mark Thomas, a geneticist from UCL, said: "It becomes a part of our understanding, I think that would be a much, much better thing. I think it would be good if people lodge it in their heads, and it becomes a little part of their knowledge." Unsurprisingly, the findings have generated lots of interest on social media. Cheddar Man's genome reveals he was closely related to other Mesolithic individuals - so-called Western Hunter-Gatherers - who have been analysed from Spain, Luxembourg and Hungary. Dutch artists Alfons and Adrie Kennis, specialists in palaeontological model-making, took the genetic findings and combined them with physical measurements from scans of the skull. The result was a strikingly lifelike reconstruction of a face from our distant past. Pale skin probably arrived in Britain with a migration of people from the Middle East around 6,000 years ago. This population had pale skin and brown eyes and absorbed populations like the ones Cheddar Man belonged to. No-one's entirely sure why pale skin evolved in these farmers, but their cereal-based diet was probably deficient in Vitamin D. This would have required agriculturalists to synthesise this essential nutrient in their skin using sunlight. "There may be other factors that are causing lower skin pigmentation over time in the last 10,000 years. But that's the big explanation that most scientists turn to," said Prof Thomas. The genomic results also suggest Cheddar Man could not drink milk as an adult. This ability only spread much later, after the onset of the Bronze Age. Present-day Europeans owe on average 10% of their ancestry to Mesolithic hunters like Cheddar Man. Britain has been something of a boom-and-bust story for humans over the last million-or-so years. Modern humans were here as early as 40,000 years ago, but a period of extreme cold known as the Last Glacial Maximum drove them out some 10,000 years later. There's evidence from Gough's Cave that hunter-gatherers ventured back around 15,000 years ago, establishing a temporary presence when the climate briefly improved. However, they were soon sent packing by another cold snap. Cut marks on the bones suggest these people cannibalised their dead - perhaps as part of ritual practices. Britain was once again settled 11,000 years ago; and has been inhabited ever since. 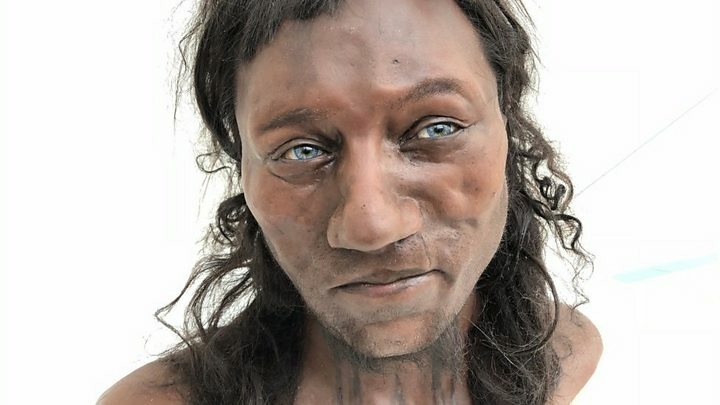 Cheddar Man was part of this wave of migrants, who walked across a landmass called Doggerland that, in those days, connected Britain to mainland Europe. This makes him the oldest known Briton with a direct connection to people living here today. This is not the first attempt to analyse DNA from the Cheddar Man. In the late 1990s, Oxford University geneticist Brian Sykes sequenced mitochondrial DNA from one of Cheddar Man's molars. Mitochondrial DNA comes from the biological "batteries" within our cells and is passed down exclusively from a mother to her children. Prof Sykes compared the ancient genetic information with DNA from 20 living residents of Cheddar village and found two matches - including history teacher Adrian Targett, who became closely connected with the discovery. The result is consistent with the approximately 10% of Europeans who share the same mitochondrial DNA type.